Women who are pregnant again after a prior c-section face a difficult decision that other mothers do not should you have a repeat cesarean section (RCS) or aim to give birth vaginally (VBAC)? There are risks associated with either choice, and it is up to individual women, their partners, and their doctors, to weigh the pros and cons in their particular situation. Some women are better candidates for VBACs than others, but many doctors prefer to carry out repeat cesareans over vaginal births after a c-section. Let's take a look at the arguments in favor of a RCS, as well as the risks. We'll also cover the risks and benefits of VBAC in another post. Many women are candidates for VBACs, but there are lots of factors that influence the decision. What was the reason the initial c-section was carried out? Are those factors present during this subsequent pregnancy as well, or do they no longer apply? If the first c-section was carried out because the baby was breech, and the following baby is presenting vertex, for instance, that might make a mother an excellent candidate for a VBAC. Those who have a bicornuate (heart-shaped) uterus are much less suitable for a vaginal birth after c-section. The main argument in favor of a repeat cesarean section is the risk of uterine rupture. The uterus can rupture where the incision was made, which can become a life-threatening emergency for both mother and baby. While a RCS eliminates this risk, a c-section is still major surgery that carries risks as well, and it is up to individuals and their doctors to make that call. 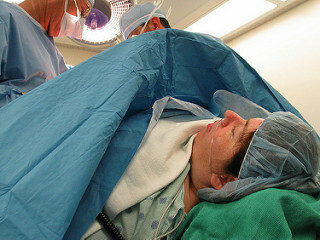 The likelihood of a uterine rupture is much higher if the c-section incision was classical, meaning vertical, rather than the horizontal incision that is most commonly made these days, so the incision type, as well as the type of sutures a woman got at her c-section should also be taken into account. Also look at is "too posh to push" a myth?